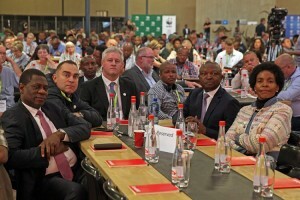 UPINGTON – MAJORITY indigenous black South Africans have expressed support to land expropriation without compensation and condemned plans by the AgriSA to report the South African government to the influential United States administration of President Donald Trump. AgriSA’ plans are the latest in a series of developments around the land issue in Africa’s most advanced economy, where the minority white farmers are resisting the expropriation of land without compensation. The stance by government is based on the fact that the land was forcibly taken by the settlers centuries ago. African National Congress (ANC), the governing party, this past weekend compiled a list of white-owned farms targeted for expropriation in the Northern Cape. Locals supported the move despite resistance by AgriSA. “White farmers forcibly took our forefathers’ land without compensation but when we demand redress they rush to the United States and West to seek justice for property they stole. This is ridiculous if not madness driven by racism,” said Lizzy Lekwene in Upington, Northern Cape. She pointed out in the West, land was solely under the ownership of white locals arguing no blacks in Europe own land. “No African person owns land in England, Belgium, France, Germany or Italy. So, why (white) cling to African land?” Lekwene quipped. A local lawyer from Kimberley, also in Northern Cape accused the white farmers of selective application of the rule of law. “White farmers want the rule of law observed when it favours them. When the majority black talk of amending the same law to enable expropriation of land without compensation they are quick to see injustice. This is double standards,” he said. AgriSA Executive Director, Omri van Zyl, said the white farmers’ organisation would engage the diplomatic community before briefing the Trump administration over the impending takeover of farms. “We condemn the actions by the ANC in the Northern Cape in the strongest terms. We will deal with it with the utmost sense of seriousness. We anticipated irresponsible statements leading up to the elections, but this amounts to cheap political point scoring,” van Zyl said. The expropriation of land features prominently in the manifestos of parties, mostly the Economic Freedom Fighters (EFF), ahead of elections scheduled for May. Dan Kriek, Agri SA President, said the organisation would engage the government, ANC, and all other stakeholders to ensure all respect due process and the rule of law. “We will not hesitate to litigate in order to protect private property rights, which we regard as absolutely critical for economic growth that we sorely need as a country,” Kriek said.